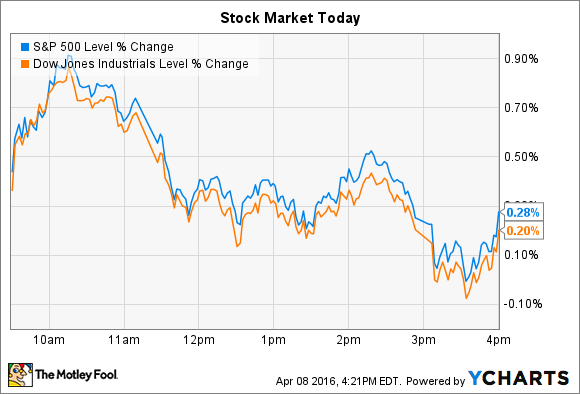 Why these two stocks broke away from broader indexes on Friday. Stocks couldn't hold on to early gains on Friday, after a strong open gave way to selling through most of the session. By the closing bell, the Dow Jones Industrial Average (DJINDICES:^DJI) had added 35 points, or 0.2%, and the S&P 500 (SNPINDEX:^GSPC) tacked on 6 points, or 0.3%. Energy led all sectors higher, spurred on by a 7% spike in oil prices to $40 per barrel. As for individual stocks Gap (NYSE:GPS) and Alliance Fiber Optic Products (UNKNOWN:AFOP.DL) both made unusually large moves. Gap was the S&P 500's worst-performing stock, falling 14% on Friday after the apparel retailer posted surprisingly weak sales results for the month of March. Comparable-store sales declined for each of its main brands, with Gap, Banana Republic, and Old Navy down 3%, 14%, and 6%, respectively. Overall comps fell 6%. Banana Republic's double-digit slump was the big surprise. That brand shrunk by 10% in the fourth quarter, but executives suggested at the time that they had a good handle on the issues that were hurting the business. "We've diagnosed [the problem]; we've fixed it," CEO Art Peck said in a conference call with Wall Street analysts in late February while pointing to a refreshed spring and summer lineup that would hopefully arrest the slide. Instead, Banana Republic's sales trends are getting worse. After Q4's 10% drop, monthly sales fell by 11% in February and by 14% in March. Meanwhile, the surprisingly weak customer traffic means that Gap now has excess inventory that it will need to work through by cutting prices. As a result, profit margins will decline next quarter, the company warned. "While March proved challenging, we remain focused on taking the necessary steps to improve results across the portfolio throughout the year," Chief Financial Officer Sabrina Simmons said in a press release. Fiber optic component specialist Alliance Fiber Optic Products soared 19% after announcing that it had reached an agreement to be acquired by Corning (NYSE:GLW). The deal values Alliance at $300 million, or $18.50 per share. The acquisition has been approved by Alliance's board of directors, and has the support of its executive team. "We are excited to join forces with Corning," CEO and founder Peter Chang said in a press release, "We believe Corning's scale provides an excellent platform for our products to access a broader customer base and drive a higher level of growth than we would be able to achieve as a stand-alone company." The company's new home will be Corning's optical communications segment, which was the only one of Corning's five business divisions to see growth last year. The move might also be enough to make the division Corning's biggest, taking first place from a display tech segment that's been shrinking as LCD prices drop. "Combining AFOP's components expertise with Corning's broad portfolio of connectivity solutions further strengthens our position in the high-growth, cloud data-center market segment," a Corning executive in the division said. The deal should close quickly, with a tender offer occurring sometime in the next two weeks and the merger finalizing by the end of the second quarter.